Whenever I ask Z what his favourite food is, he will say "Rice with black chicken and broccoli and carrot", and even if I offer other suggestions (in case he might have forgotten about the rest of the yummy food mummy has cooked for him in the past), he will still insist on the black chicken.﻿ I am glad he likes it because it is one of the easiest things for me to prepare with only 5 ingredients: Chicken drumsticks, ginger, sesame oil, dark soy and light soy (seasoned with sugar, salt and pepper). Today I tried a different version of ginger chicken, one that substitutes the soy sauce and sugar with fish sauce and brown sugar. I also decided to put in a little effort to debone the chicken drumsticks which I usually don't (okay, actually it was so that I could try out using my new Scanpan Santoku Knife that I purchased last weekend). 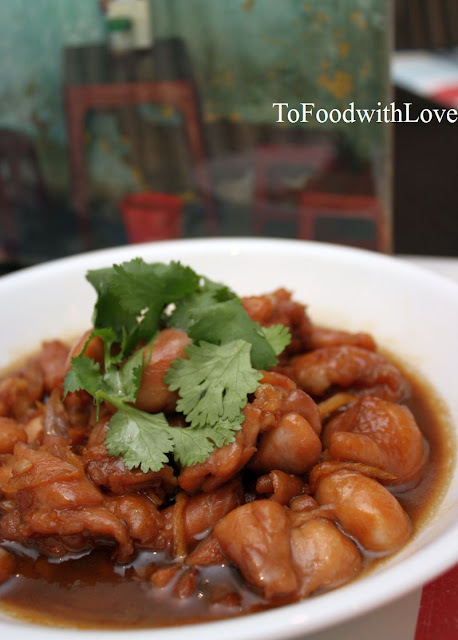 For those who love eating ginger chicken, you will love this version too. The succulent pieces of chicken covered in a salty, sweet and sticky sauce with aromatic ginger will definitely go down well with a big bowl of rice! I will be cooking this more often from now, and perhaps Z will soon say "brown chicken" instead of "black chicken" as his favourite! Marinade chicken with soy sauce, oyster sauce, 2 tbsp fish sauce, 1 tbsp brown sugar and the cornflour for half an hour. Combine the remaining fish sauce and brown sugar with the water and put aside. In a wok, heat up vegetable oil and sesame oil and fry ginger until fragrant. Add chicken and fry on high heat until browned all over. Add garlic and stir-fry briefly. Add the fish sauce and sugar mixture and stir into the chicken until it comes to a boil. Cover and simmer on low-medium heat for 5 minutes until chicken is cooked. Remove the lid and simmer until sauce is thickened. Dish out, garnish with coriander and serve with jasmine rice. This looks so good! Can't wait to try it!